Gooey Hearts Day is what they named Valentines Day on this cartoon my daughter likes (spelling? Rolly polly olie). 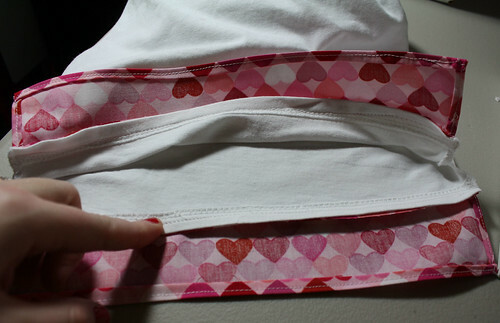 I thought it fitting to make this shirt with things that were Valentine like so it could be her Gooey Hearts Day shirt. She loved the shirt and most importanly, the name 🙂 It’s a simple makeover to give a shirt for a little one or an older one. I love the bottom part because it made this shirt longer, expanding it’s wearable life. Many times she can still fit in smaller sizes, they are just too short on her. -Determine how wide and long you want the strip down the middle to be. To determine the width measurement, take your desired width x 2. For the length, add how long you want the strip to be plus how much longer you want to leave for the part to tie and add an extra 1/2 inch for seam allowance. (My daughter’s was 13″ by 3″). This will be piece one. -The second piece you need to cut is for the other tie to make the bow. Take the length of piece one minus the length of the middle strip (the part that will have the buttons on it). Add an extra 1/2 inch for seam allowance. The width will be the same. (My daughter’s was 9″ by 3″). 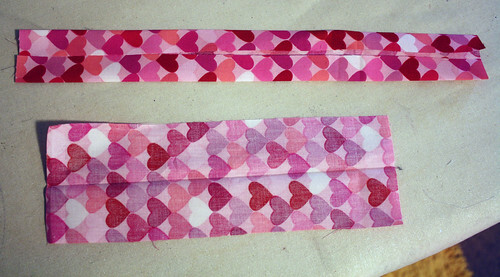 Take the two strips and fold in half, wrong sides facing. Iron. 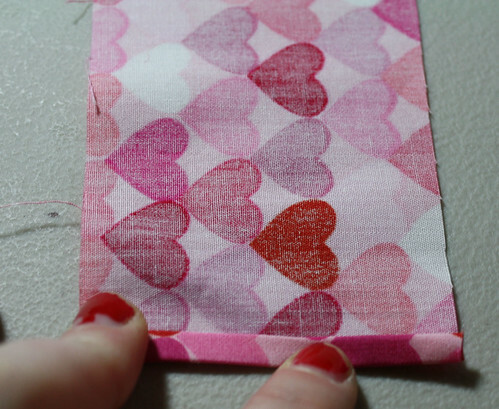 Open pieces up, then fold each side towards the middle crease and iron. Turn up the bottom at each end and iron. Fold back in half and sew down the open side and the bottom that will be left hanging to tie into a bow. 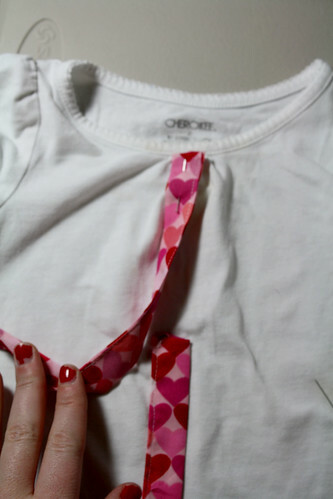 Pin the longest piece at the middle top of your shirt. Pin the second piece on the middle a little above where the middle strip will end. This will make sure it is sewn on. Sew down the side right on top of where you had sewn it earlier, but this time it’s on the shirt. Then continue sewing around until you have it all sewn on. Tie the ends in a bow. Sew on buttons. I used embroidery thread to extra contrast and a stronger hold. 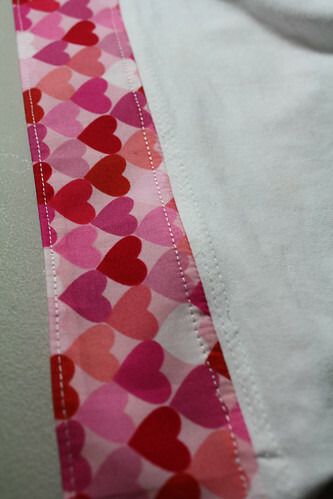 To add a bottom flap, clip at the bottom of the side seams. I would cut it to right above the bottom seam. Measure how long the bottom is on the now front flap and the back. This will be the width of your fabric measurement plus seam allowance. (I added an extra 1/2 inch). For the length, just decide how long you want it to be plus seam allowance. (I added an extra 1 inch for my seam allowance). Cut two pieces in these measurements. Fold one side end over once, towards wrong side, and then again and iron. Sew down that side. Do the same for the other side. 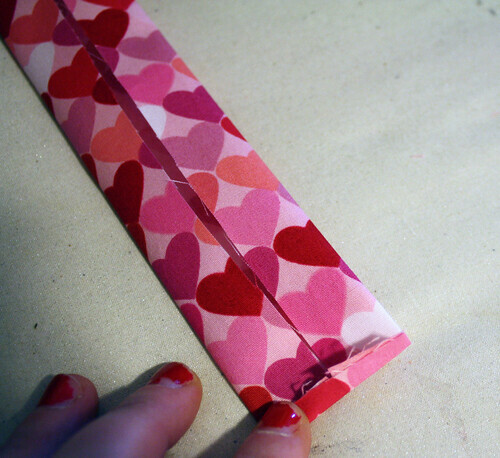 Fold up the bottom once, towards the wrong side, and then fold again. Iron. Sew across. Place front flap on, right sides together, and pin. Sew across. Repeat for back flap. 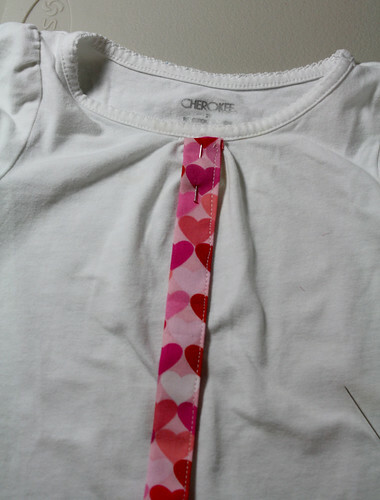 Turn seam towards fabric on the inside of the shirt. 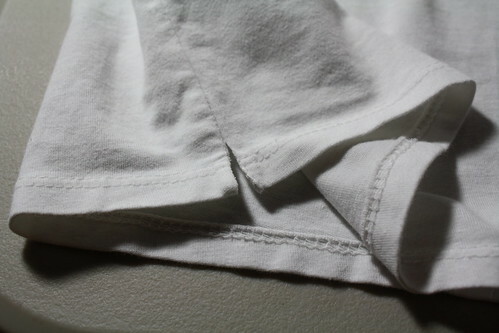 This will cover the fabric ends and prevent fraying. 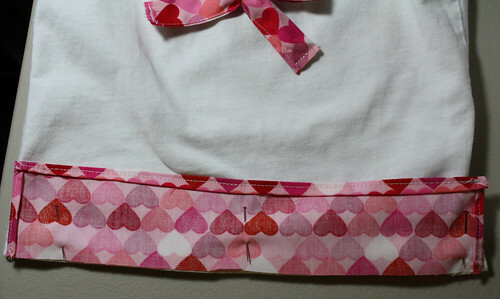 Sew right over the pushed down seam to hold it in place. Admire your pretty new shirt. And then maybe think of some pretty accessories to make to match. so cute! I love valentine’s day for all the cute colors. I love this! My daughter’s shirts get too short too, so I’m loving the lengthening idea. Thanks!! That’s super cute! I’m going to try it with a shirt of my own. Fabric colors and desing beatiful. thanks for sharing!have good day. I love the lengthening of the t-shirt idea. I think every mother runs into that problem. It has something to do with the little toddler budda belly. Now I’m off to adapt this for my boys! I love the shirt! Come share your creation at my party: Thursday’s Treasures! i love this!! thanks for posting instructions!! Oh what an adorable idea!! 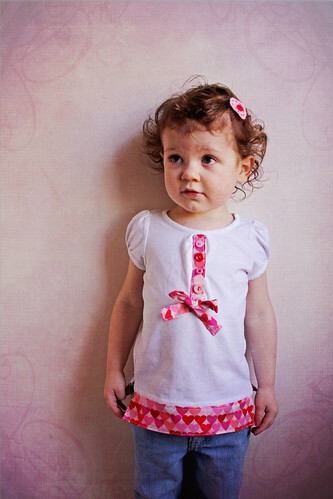 My 2 year old’s shirts are always getting so short – what’s with that?? Thanks for the post!! I love this! Will definitely give it a go on a shirt I have lying around. It would be fantastic in most any color scheme, too! LOVE IT. So clever- I love it! very very very cute idea! 🙂 thanks for sharing. Oh, that is just too cute! I’ll have to give that one a go, I really like the idea of how to put that little bow on! A nice touch. This is adorable–I was just thinking that I needed to do some valentines clothes shopping, but you’ve inspired me to remake something we already have. I love the buttons especially. Nice work. Just when I think I can’t love your blog anymore, you come out with this shirt! Thanks for sharing! 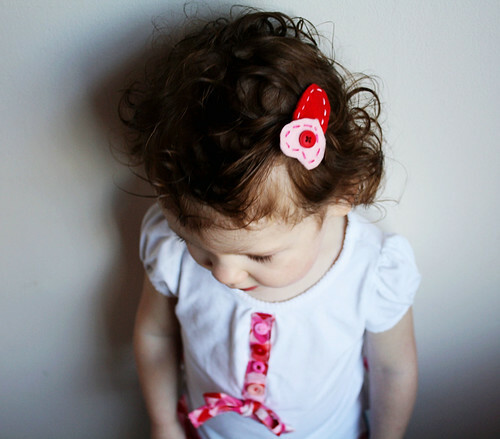 holy cute, your daughter is adorable! Love the shirt! 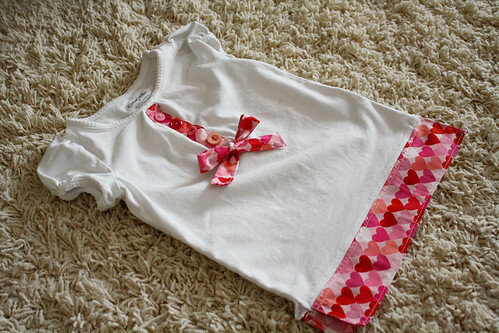 This shirt is sooo cute! 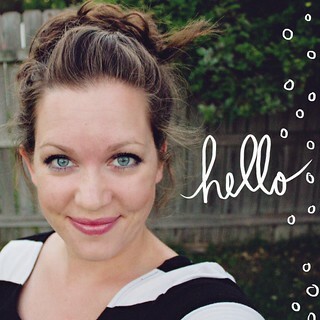 I’d love for you to add it to my ‘El Cheap-O Shirt Challenge’ on my blog! Oh gosh – she looks so adorable! Love this tute! great one. allways looking for a way to revamp in an inxpensive way. That is to cute! How fun for any holiday. Thanks so much, I’ll be linking. she is cute! and so is your shirt! So sorry – I was a bit distracted while posting my last comment… I suspect you’ll understand. :>) I also have a skinny minnie who grows out of things in length long before width! :>) Super cute job – I linked to this on my weekly roundup – thanks so much! Hi Jessica – As usual, you have wonderful tutorials. 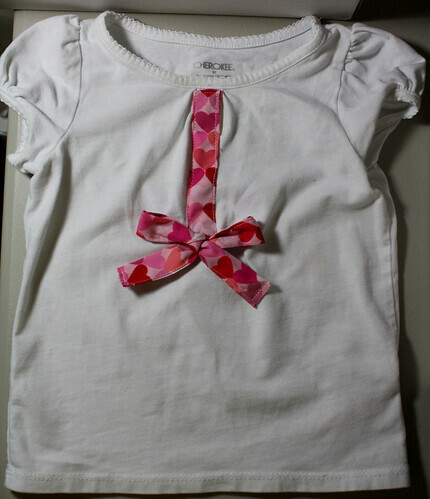 We’ve used this tutorial at our SewingBusiness blog at http://sewingbusiness.com/2010/02/05/gooey-hearts-toddler-shirt.aspx — thanks for a great blog! very cute! 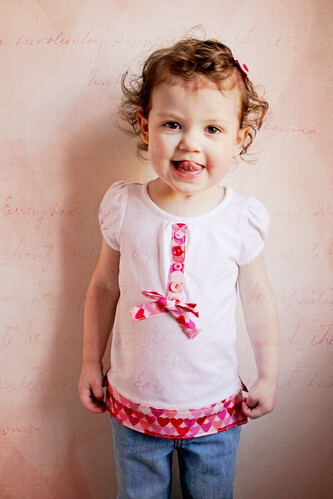 hearts and candy pink – every little girl would love this!